The waters were churning and the sharks were circling, but Sacred Heart University’s freshmen business students were well prepared to defend themselves from any attacks. And stay intact and afloat they did after presenting their creative business concepts recently in SHU’s Fall Business Plan Competition. 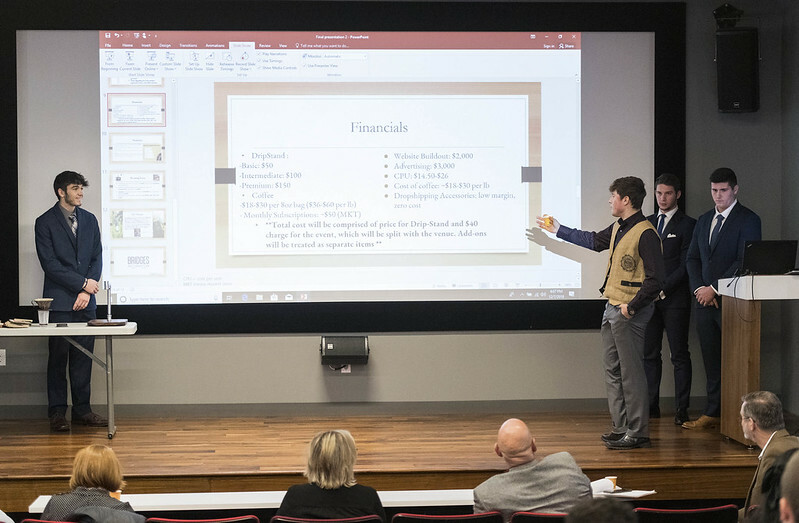 Staged like the popular “Shark Tank” TV series, the challenge pitted teams against one another as they presented their plans to panels of judges selected from the regional business community. In all, 10 student teams competed, while their peers cheered them on in the audience at the Frank and Marisa Martire Business & Communications Center forum and media theater spaces. Forty-five other teams of freshmen business students showed posters illustrating their own concepts in the Martire Center’s upper and lower hallways. Overall, about 300 freshmen participated across the poster and presentation effort. Forum first place: Lyte Pong, a revolutionary cup pong game with sensored cups and mat and an accompanying app. Team members: Alexis Arago, Hana Bowman, Sarah Forrester, Tyler Lowe and Lydia Werlau. Coached by Professor Tuvana Rua. Forum second place: Swipe Sport, an online sports betting program. Team members: Braden Hearney, AJ Michalek, Jake Moynihan, Anthony Rendino and Brendan Sullivan. Coached by Professor Bruce Pflug. Media Theater first place: Clix, a sport shoe made specifically for BMX riders and skateboarders with replacement soles made from recycled materials. Team members: Jayda Breeland, Madison Laferriere, Dimitri McCombs and Madison Laferriere. Coached by Professor Tony Macari. Media Theater second place: Freeway Gigs, an app for college students with a platform to provide and request services from each other. Team members: Nikki Johnson, David Wall, Brenna Leonard, Logan Larochelle and Thomas Stolfi. Coached by Professor Thomas Coughlan. Best Product: PetSavior, a comforting device for pets to provide a calming massage when the owner cannot be home with the pet. Team Members: Kiana Barnett, Calvin Call, Paul Creary, Carson Decaro and Fatima Ramos. Best Service: SHU Eats, an on-campus food delivery service. Team Members: Dan Birmingham, Maddison Craig, Adrianna Fierro, Will Horrigan, Jake Niesen and Alix Polk. Best Idea: Pet Nav, a small, simple-to-use-name tag that provides medical information and GPS capability for your pet. Team Members: Brianna Degennaro, Nicholas Greco, Gabrielle Nardi and Eric Sippin. As for the “sharks,” the judges for the Forum presentations included Dennis Kozlowski of Harborside Advisors; Kathy Shea, vice president, supply chain management, Bigelow Tea; Bill Alvarez, chief financial officer, Harvest Capital Credit Corp.; and Phil Palmieri, president, Integrated Print Solutions. Judges for presentations in the theater space included Fred Palmieri, president of Palmieri Real Estate Services; Lynn Halper, former executive vice president of Partner Reinsurance; Joanne Bartmess, chief financial officer of Brownstone Investment Group; and Tracy Budnik, principal of Bridge Analytics. Student teams formed in late September across 10 classes and worked most of the semester to create, finesse and practice their presentations. The teams judged “best” in each class, according to certain criteria and determined by faculty, proceeded to the competition. In the forum, the teams were Swipe Sports, Pain Punch, Team Revolution, Boozebar and LytePong. In the theater, the teams were Academic Attire, Freeway Gigs, Bridges Coffee Curators, SaverSpot and Clix. Each team was charged with fleshing out a host of criteria about their product or service, including benefits, competitive analysis, future promise, price, promotion strategies, access, marketing/advertising, target market, consumer profile and finances. Concepts aimed to fill voids in the marketplace. SwipeSports, for instance, offered a new fantasy sports betting website that claimed to be simpler and easier than other similar sites, while delivering a higher chance of winning. Pain Punch promoted a sports drink that delivers hydration and pain relief, targeted to high school and college athletes. Bridges Coffee Curators promised social events for coffee-lovers, with quality coffee, discussions, product education and interactivity. SaverSpot hoped to be the go-to application for finding garage parking spots in major cities during rush hour.